Fun and learning was on the menu as schools and nurseries joined together to show their enthusiasm for all things Fair Trade. The East Dunbartonshire Fair Trade End-of-Year Event was held at Lenzie Meadow Primary recently. Youngsters made Fairtrade logos from fabric remnants and dyed rice, created animal art using tea and coffee, dipped bananas into a Fairtrade chocolate fountain and enjoyed a ‘Gold Hunt’. Activities were led by Mosshead Preschool, Riverside Childcare, Lenzie Meadow Primary and Nursery, and Lenzie Academy. 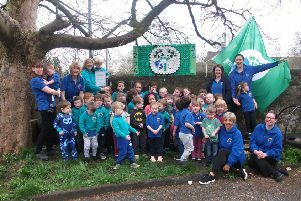 The event marked the fifth successful year of the Fair Trade Nurseries programme locally. East Dunbartonshire Fair Trade Steering Group campaigner Tracy Mitchell, said: “This was the first collaborative schools and nurseries Fair Trade celebration and it was fantastic to see Academy pupils, primary school children and pre-schoolers all engaged in fun Fair Trade activities together. “The event was rounded off with singing and dancing, and the presentation of certificates. Councillor Gillian Renwick, Depute Leader of the council, said, “I am delighted that children of all ages had the opportunity to share and develop their Fair Trade knowledge, skills and experience via a series of activities. “It was an opportunity to discuss good practice, the difference we can all make and ideas for the future. East Dunbartonshire’s status as a Fairtrade Zone - first secured in 2007 - was recently renewed for another two years. The council also approved a new resolution reaffirming its support for local Fair Trade efforts.